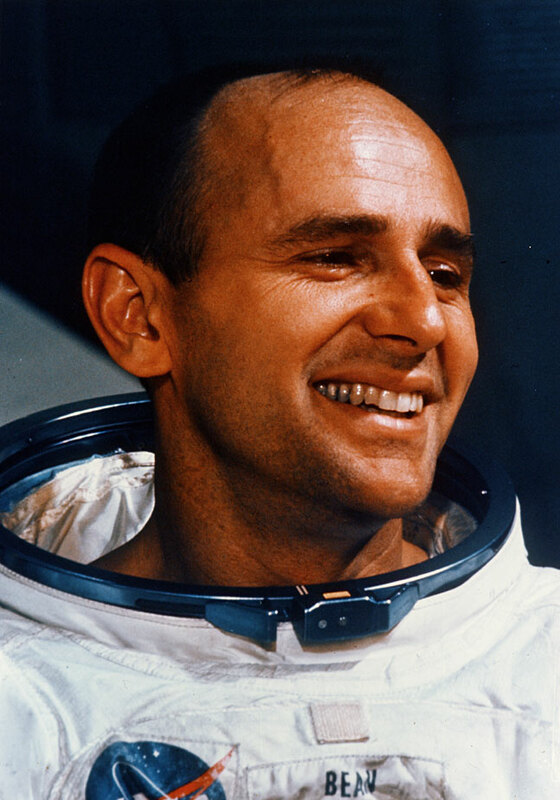 Copyright © 2005 by Alan Bean. Last revised 2 September 2015. 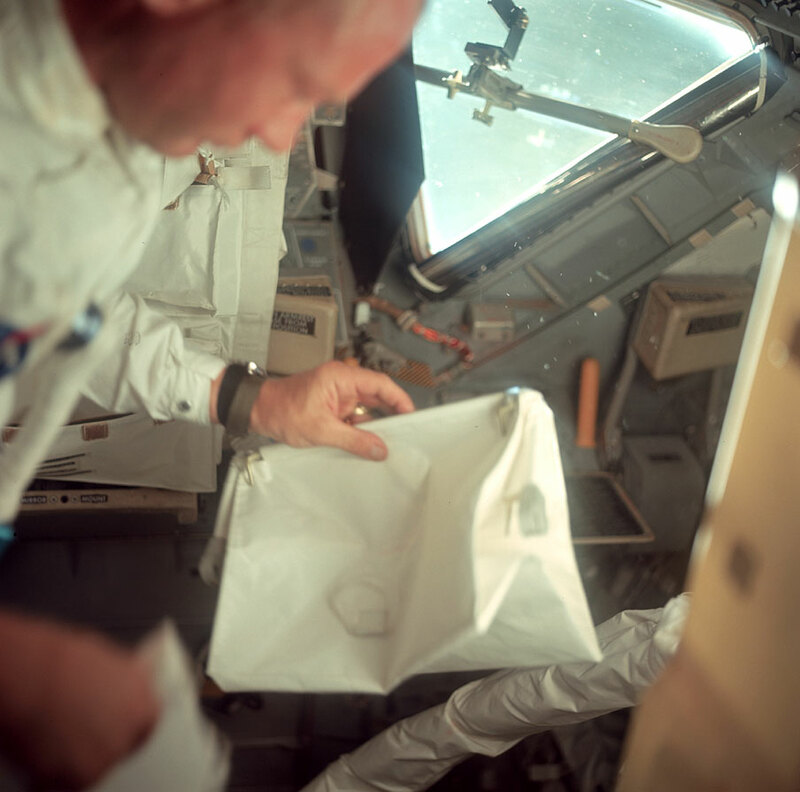 "The McDivitt Purse was stowed during launch, so it doesn't show up on close-out photos and things like that. I think we had one, that we unstowed when we activated the LM and attached it under the DSKY somehow. There is a pin on either end at the top of the purse ( more about this later) that looks like they might push into holes in the LM frame under the DSKY, but I'm not sure." "If you look at the purse when you are standing in front of the DSKY it looks like a rectangle of white beta cloth 9 inches high by 12.25 inches wide. If you look at it from either end it looks like a pyramid with a base of 8 inches. All this is just Beta Cloth sewn together so it's soft, except for the top which has a U-shaped metal frame sewn in to it." "If we go back and look at it standing in front of the DISKY again, the top is closed with a metal frame that is sewn inside the front and back of the Beta Cloth, running the whole 12.25 inches across the top, and then down to the middle of the ends." "If we look at it from the ends we see that the metal frame goes about half way down the center of the pyramid and is hinged, and the two U-shaped frame members are hinged. So what we have is a inverted U-shaped frame sewn into the top of the Beta Cloth when viewed from the front; and we've got a similar inverted U-shaped frame sewn in the back. These two meet about half way down the 'pyramid' on each end. They are spring-loaded so that either Pete or I could reach over and pull the purse open, throw something in, let it go and it would spring shut." Neil took this picture of Buzz with the purse during the initial LM inspection. 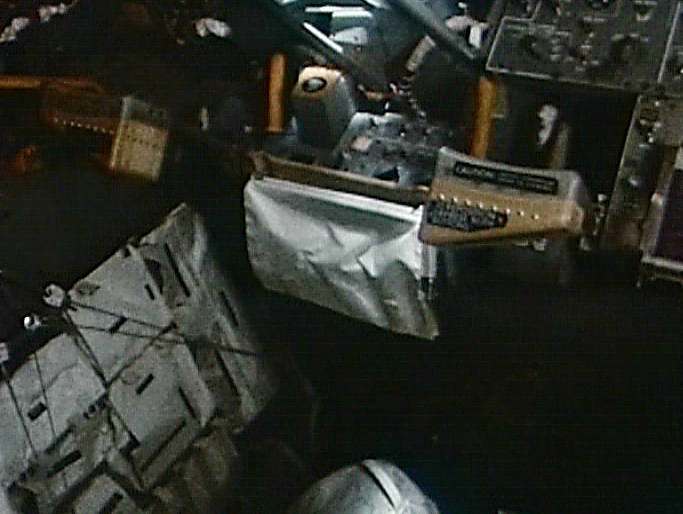 Frame from an in-flight, 16-mm sequence shot in the Apollo 17 LM shows the purse attached under Panel 5.